In the dreams that you dream on the way. Sunday, October 13, 2013. The day. 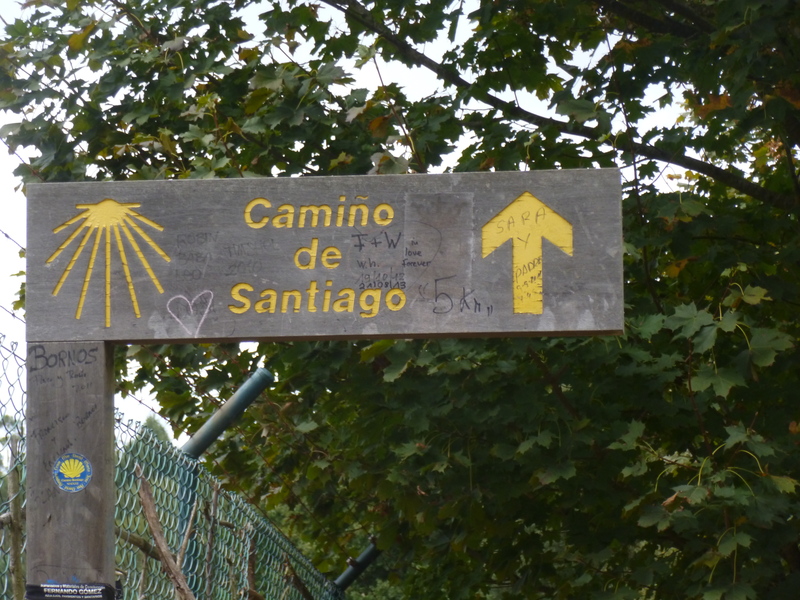 Today, I walk into Santiago de Compostela. Ria and I begin at Santa Irene, out the garden gate in the dark and headed for somewhere down the road that is supposed to serve breakfast. So we walk together this time, stomachs growling, looking around every bend for “the place”. When we see it, it is bigger than we expect, and is packed. Apparently this is attached to a hotel, so there are many people in more pampered peregrino situations, trying to get their breakfast as well. About fifty people in this place, and one poor guy trying to do the cafe con leche, eggs, and all the rest. We get our cafe fairly quickly and then sit down to wait for the rest of the food, but the man seems to forget, so after about 20 minutes, I go back up to the bar to kindly nudge him. Apologetically he scurries back into the kitchen and soon comes out with our eggs, toast, bacon (well, really another version of jamon, yes?) and juice. Yum! We will need this nourishment because it’s supposed to be raining today. 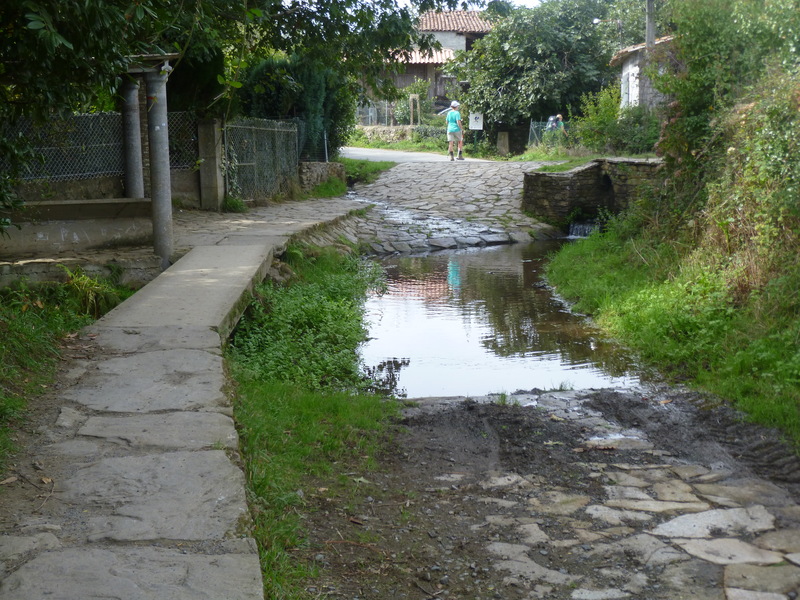 The water interrupts the regular pathway, so locals have built an alternative walkway. Finally we’re finished here at the restaurant and begin the way each of us does every day. But today will be the end of this ritual. Establishing a new one in the next days, weeks, and months will be a challenge for everyone who has been on this trail. For now, I’ll try to take it as I have been doing, one step at a time. It must have been raining in the area on and off for days, because many of the paths have stone upper-level walkways so we can avoid being ankle deep in puddles. There isn’t as much lovely scenery here, as I begin to come into the outskirts of Santiago long before I expect it. For those of you in Colorado, picture heading to Denver, but walking through Brighton, Broomfield, and Thornton before getting to the State Capitol Building and the pretty parks. Double-packed, both turtle and kangaroo . . . The Santiago area airport is 12 km from Santiago center in an area called Labacolla, so gone is the Galician landscape. Abut the time I reach that area it begins to rain, first just sprinkling on and off, to give all of us a false sense of security. I still haven’t dragged out the sailboat poncho, but I look like half turtle (full pack on back) and kangaroo (day pack on front). 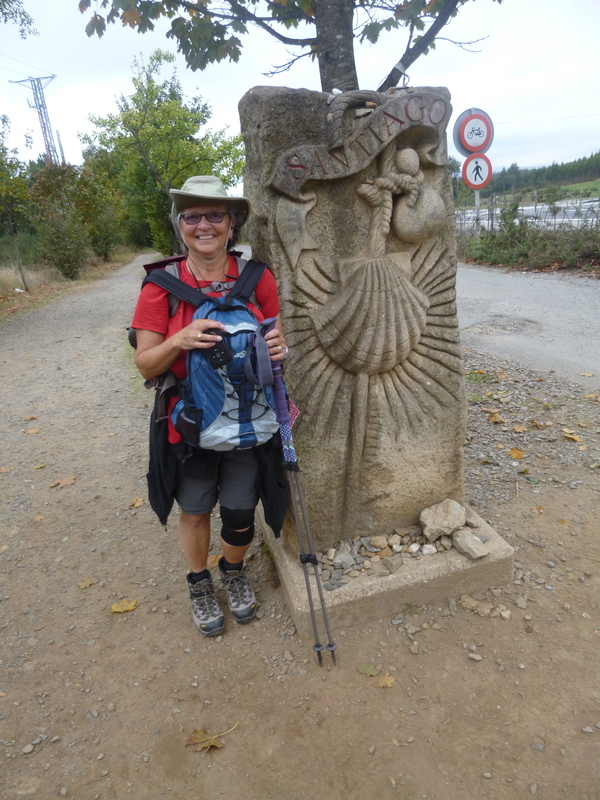 I realize no one will be around when I walk into old Santiago, but I see a beautiful camino pedestal right on my way and ask another trekker to take a photo of me. Some of you have seen it on FB, but here it is again. 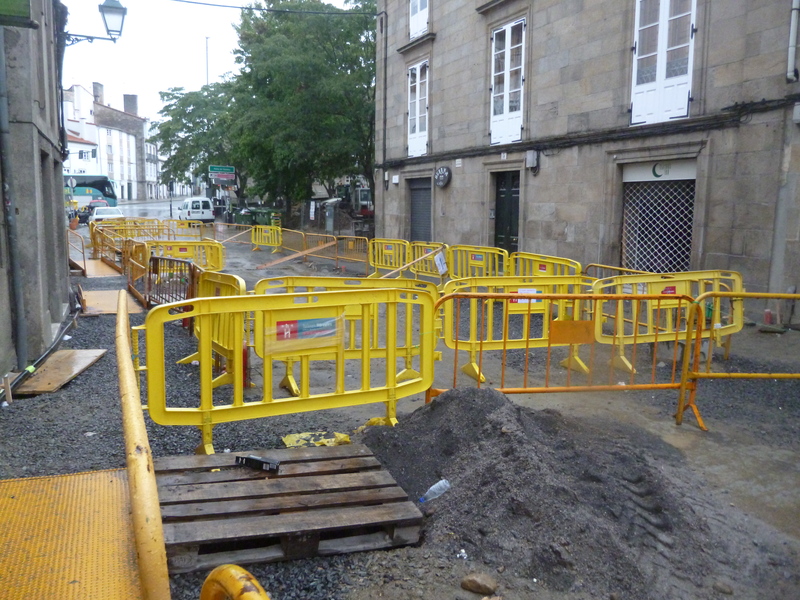 Brierley suggests that when you walk into the outskirts of Santiago de Compostela, you sort of imagine a bubble around you, so the traffic and relative ugliness of the industrial section doesn’t permeate your mood. I do this. I breathe slowly, walking at a steady pace. The arrows are sometimes hard to find, but they are relatively consistent. Passing warehouses, truck repair places, empty buildings, and a few bars, I see one old guy, long hair, white beard, looking sort of like Maharishi in dungarees, and he lifts his arms in victory for me. I smile, nod, and switch the hand that holds my umbrella above me, since it’s now pouring, with no thought of stopping. Other than to this man, I seem invisible, and I see no other pilgrims around me. 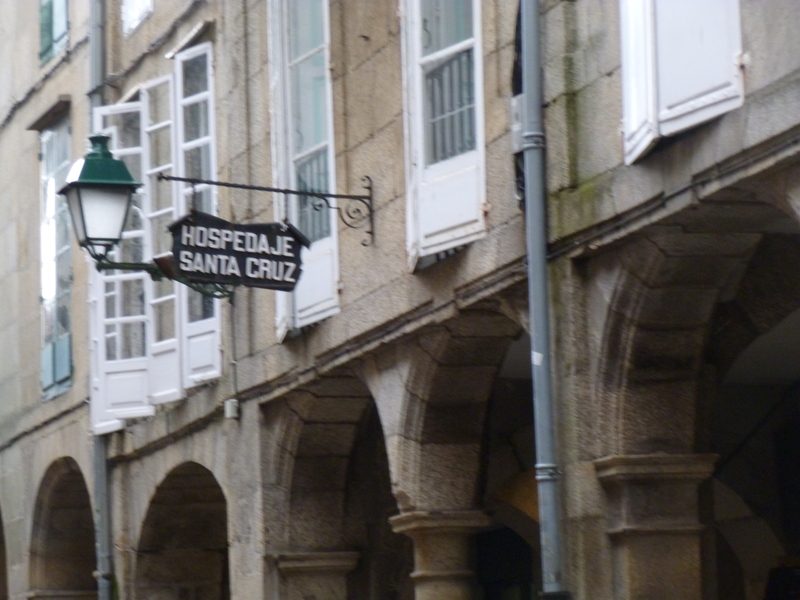 Christel stayed in Monte del Goza last night, as did many others, about 5 km from Santiago. They could walk in this morning, get their Compostelas, store their packs at their albergues and get to the 12:00 noon Pilgrim’s Mass. Ria and I will do that later today, with the mass tomorrow, because I’m coming in at about 4:00 p.m. I finally do see a few other people with packs and walking sticks, just as I need to ask (yet again), “Donde esta Catedrale?” Who knows whether my Spanish spelling is as bad as my speaking ability, but I make myself understood. Three trekkers next to me at a stop light tell me they are priests from Eastern Europe, working in Siberia. I follow them. Construction barriers welcome peregrinos . . . not! Arriving finally in the old city walls and heading down the main street toward the cathedral, I am greeted with completely torn up streets and yellow rail barriers. Apparently they have to replace sewer pipes sometime, so why not during my arrival, since I haven’t been looking forward to this anyway. They turn around, shrug, bring me the sticks, which they have already succeeded in collapsing to their shortest length. They mutter something in Spanish, and I realize that we are not in dreamland anymore. On the Camino, no one would have dreamed of stealing anything that belonged to a fellow pilgrim, but I guess now that we’re in the big city, we’re mingling with the hoodlums and thieves. Nice welcome. And it seems to be the crowning touch on an already depressing finish. Oh, I know, it’s supposed to be this exuberant entrance, but just like many other hyped celebrations, this one didn’t live up to much. I’m ready to walk again, out of town. “Well, then,” he says, “you can mark Religious or Spiritual.” “Fine,” I say. And he marks the spot, writes the Latin version of my name on the Compostela, also written in Latin and hands it to me. It has been stamped, as has the credencial I have presented him. Actually, it’s now two credencials, since I ran out of space about three towns ago and bought an extra one in Barbadelo for that reason. Sleeping in Santiago the first two nights. I buy a cardboard tube for my Compostela and walk out into the Rue de Vilar, where I again hear that familiar voice. “Joannah!” It is Ria, who has found my hotel, named Santa Cruz, right down the row from where I now stand. She’s checked herself into a room, and is ready to lead my disheartened self to claim my reservation. I tell her about the attempt at stealing my sticks. No, the successful theft of the sticks, and my recovery of them. She agrees that this incident, coupled with the yellow barriers on the torn-up road, are anticlimactic to what we have each experienced during the past six weeks. We go to the hotel, I find the old man who runs the place, pay him, he settles me into a dumpy but private room next to Ria’s, and Ria leads me out, across the street to a nice bar and restaurant where we can get a drink. I gather my bubble around me again. We’ll text Christel, tell her where we are, and go to dinner. Tomorrow at noon is another Pilgrim’s Mass, and perhaps they will swing the Botofumeiro, an enormous incense burner (again, see the movie, The Way, or my Facebook page) in honor of all of us. Historically, the priests swung the Botofumeiro because the pilgrims smelled so bad, all congregated in the church together, but now, God invented showers, so the incense burner only swings on certain days, or if someone pays 300 Euro to see it, or on the whim of who knows who. It is the one thing I anticipated eagerly as I planned my trip this past eighteen months. I hope it swings. Perhaps it is better to travel hopefully than to arrive. It’s just cool that you decided to do this, and DID it. Yay, you. Congratulations on your achievement. You inspire me! Congratulations, Joannah! I hope this doesn’t mean you won’t be writing anymore! I’ve looked forward to your posts, have read all and re-read many, and have read segments of them to Judd. If a few days pass without me reading from one of your posts, he asks about it! 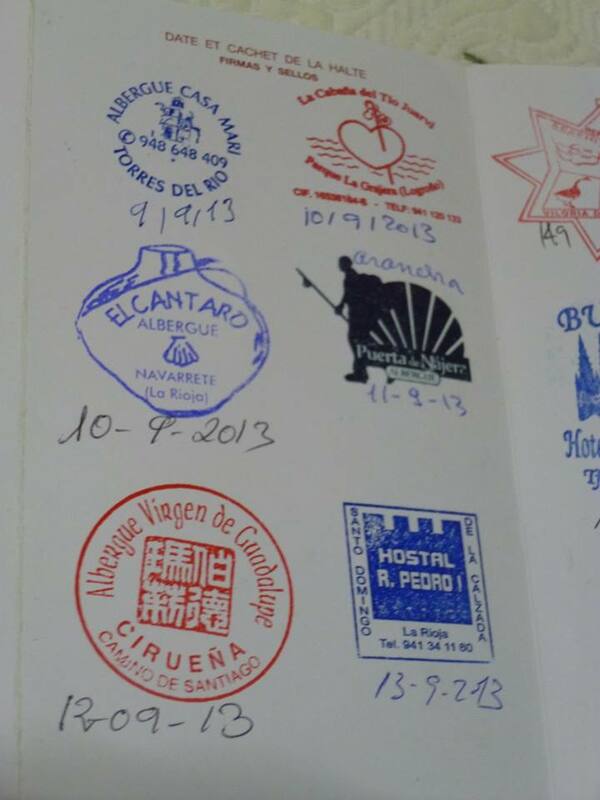 Congratulations, Joannah, on walking the Camino. What a journey. What an achievement. I’ve enjoyed your walk through your wonderful and descriptive posts and telling pictures. I loved the photo of your stamped credencial. Many cheers for you for your tremendous accomplishment! Nothing like theft of your gear at the end of a meaningful trip. I know that feeling. After five weeks traveling solo in Alaska, including a week in remote wilderness accessed only by bush plane, I finished in a campsite near a main road. After an afternoon hike, I came back to my camp to find my backpack, food, and stove gone. The ending may not be pleasant, but you can always know that you savored the entire extraordinary journey, gave a gift to yourself, and inspired many others.